How many times we have heard the disdain of regret from art collectors who did NOT purchase a painting in the estate sale of a well-known, accomplished Indiana artist… Our May 12 auction of the work of Sally Brant Kriner (IN, 1911-2011) gives buyers a chance to redeem themselves. Sally was the longest-tenured member of the Brown County Art Guild in Nashville, IN, and the influence the Guild’s founders had on her painting style is uncanny, even to the least-trained eye. 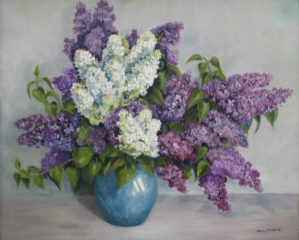 Her painting entitled “Marie’s Peonies”, which sells in the estate auction, is her interpretation of the Marie Goth painting that is currently in the window at the Guild gallery. Sally was friends with, and learned from, Goth, and her still life execution mimics style and brush strokes of Marie’s still life paintings. 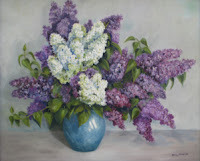 Sally’s strength was in florals and still life paintings, and Marie’s influence on her is quite remarkable. Some of Sally’s landscapes also remind us of VJ Cariani landscapes, and although she never achieved his expertise (as few have), it is evident that, at some point, she learned from him and applied some of his techniques in her own landscapes. There are some nice Indiana landscape paintings available. We also see a few of Sally’s paintings that are reminiscent of Leota Loop’s still life paintings, but far fewer mimic that style. One thing Sally did share with Loop was the extensive use of Ginny frames. Several of Sally’s paintings are housed in the desirable Ginny frame, and a few ‘Ginnys’ are available for purchase in the uncatalogued portion of the auction. In 1954, Marie Goth, V. J. Cariani, Carl Graf, Genevieve Goth Graf, Curry Bohm, Dale Bessire, Georges LaChance and other notable artists formed the Brown County Art Guild, Inc. , and Sally’s affiliation there trumped those artists in terms of years as a member. 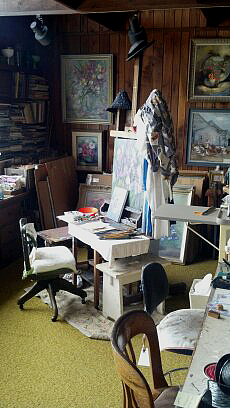 Sally’s estate auction is a tip-of-the-hat to the heritage of fine art in Brown County, and her commitment to continuing the legacy in the style and manner of her predecessors is visible in her art and in her Freeman Ridge studio, which contained paintings by some of those aforementioned artists. Some were in deplorable condition, and most would have destroyed them, but Sally maintained those paintings, perhaps as an homage to those historic artists. Some of those paintings sold in our April auction, the rest will sell in the May 12 session, right alongside Sally’s paintings, just as they’ve been for many years. There are also some treasures to be found in the uncatalogued session, featuring art and art supplies, Sally’s still life subjects (vases, figures, etc. ), vintage frames, paint brushes, canvases and more, including some unfinished Marie Goth portraits. A lovely story about Sally, written by our friend Rachel Perry, is available here. We are pleased to represent Sally’s art and legacy at the May 12 auction.